Here Comes the 1st Update from C-WARS! Can we just say YOU’RE AWESOME?! What we’ve achieved within the first 24 hours is totally beyond our expectation. Your contributions have already funded more than 1/3 of our goal. As an unknown Chinese indie game developer, your support has given us so much confidence that has really motivated us to work harder. Indie spirit rocks! In the meantime, we have begun writing FAQ to selected questions. Check out our Kickstarter page once in a while for more updates and answers! We try to reply to comments and inbox messages as many as we can, but our team is so tiny that it’s almost impossible for everyone to be answered in a short time. Please don’t be disappointed if you haven’t heard from us yet. A BIG thank you goes to our amazing indie friends who have been greatly supportive of our Kickstarter campaign: “Cryamore” from NostalgiCO (Chicago, US), “They bleed pixels” from Spooky Squid Games (Toronto, Canada), and “Wooden Sen'Sey” from UpperByte (Lyon, France). And Cryamore fans - you guys are just crazily awesome! Thank you very much for trusting us. We won’t let you down. Love the pixel art. Love your vision. I am a proud backer and can't wait to see the finished product. will the pixel version of you be in the game? Sorry for the spam DD:... Wrote more than I thought..
Mmmmh.. @. @ Not a big fan of making pledges that give extra heroes/items for backers-only and leaving the normal people without them (I mean, they still pay for the game, why close something from them that is still in their game? 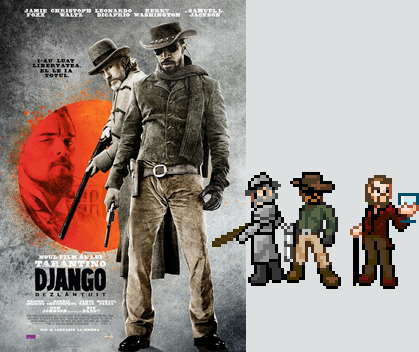 x: ) Ohwell, everyone their thing :3..
You should totally make a Django pixel hero now!